The impact of House Speaker Joe Straus' departure from the Capitol can't be understated, according to one political scientist: "The political center of the state collapsed today." 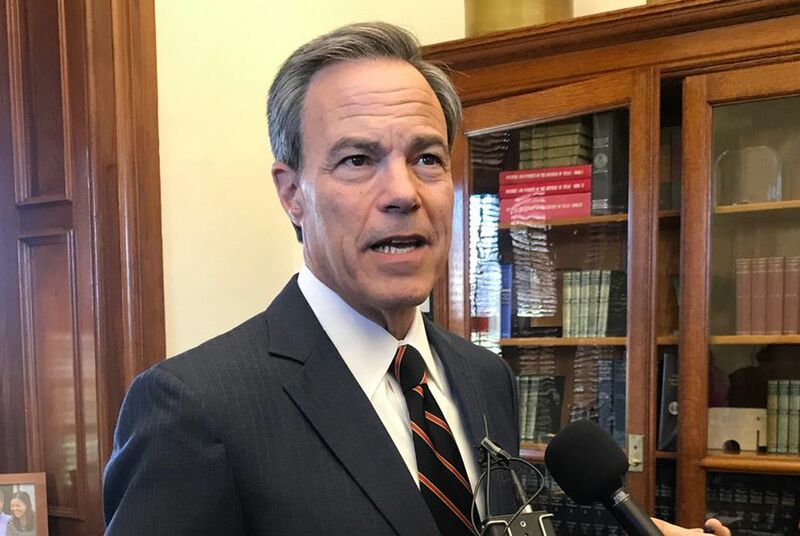 House Speaker Joe Straus unleashed a political earthquake Wednesday when he announced he would not seek re-election next year. The policy aftershocks could be felt for years. "This is really an earth-shattering event for politics,” said Rice University political scientist Mark Jones. “It's tough to overstate the relevance of this for Texas politics. The political center of the state collapsed today." More than any other Texas Republican with real power, Straus was seen as a voice of moderation. On issue after issue, he and his team alone stood in the way of the kind of runaway populism that Donald Trump championed and major statewide Republicans endorsed. When firebrand Lt. Gov. Dan Patrick and Gov. Greg Abbott rattled Fortune 500 companies with talk of a “bathroom bill” that put transgender Texans in the crosshairs, it was Straus who held their collective hands and ensured the measure wouldn’t become law. When conservatives pushed to take away in-state college tuition rates from undocumented Texans, the speaker’s top lieutenant, Byron Cook — who lent his Austin home in 2009 to the rebellion that put the gavel in Straus’ hand — snuffed it out. And when other Republican leaders pushed property tax legislation that didn’t include the school finance enhancements Straus and his House supporters wanted, the speaker risked blowback from fellow leaders and the Republican base — and got it — by letting a special session die without producing either. For the conservatives who wake up every morning wondering why a moderate Republican from San Antonio keeps thwarting their agenda, Straus’ bombshell announcement was greeted with a sort of collective “good riddance” — along with a call to action to replace him with a staunch conservative. Moderates in Straus’ coalition, though, will be left to wonder if Straus’ departure opens the floodgates to policies that will hurt Texas' standing as a pro-business state that welcomes diversity and its fast-growing Hispanic population. Jones, the Rice political scientist, said without Straus blocking pet initiatives their base wants, the governor and lieutenant governor will have to think long and hard about passing initiatives that many mainstream politicians and pro-business groups have opposed. At a press conference Straus hastily convened to drop the news of his departure, the speaker dismissed the notion that his stepping aside would embolden the most conservative wing of the House GOP. "I don't think the Freedom Caucus will grow," Straus said, referring to the 12-member bloc that was frequently a thorn in his side earlier this year. "I think they're sort of self-limited. I can't imagine very many people wanting to identify with the way they practice politics. I just don't think that's a constructive approach, and they're not, in my mind, the profile of respectful leadership that I hope to support." In an interview with The Texas Tribune on Wednesday afternoon, Straus acknowledged the next session may bring attempts to revive some of the divisive proposals he opposed. "Every session there are thousands of bills and only 20 percent or so pass," Straus said. "So you’ll see a lot of bills filed that didn’t pass this time filed again. Some of them may be those high-profile bills — I don’t know — but every legislature starts anew, and there will be a new population of House members here next session." Straus' retirement announcement — as well as that of Cook of Corsicana, who regularly blocked controversial legislation backed by the far right — raised further questions about the fate of other members of his moderate coalition. "For those wondering, I'm not going anywhere," tweeted state Rep. Charlie Geren, the Fort Worth Republican who chairs the House Administration Committee. State Rep. Dan Huberty, R-Houston, who chairs the House Public Education Committee, continued to be noncommittal about his 2018 plans. "When I make a decision, people will know," Huberty said. Some House members who backed Straus held out hope that Straus' replacement would continue to be a moderating voice in a Capitol that continues to veer toward the hard right. That includes Democrats, whose support for Straus over five terms effectively blocked the ascendance of a more conservative alternative in the speaker's chair. "As past speakers have been, the next speaker will be elected only with bipartisan support," said Rep. Chris Turner, D-Grand Prairie, leader of the House Democrats. "When the full House votes on a new Speaker in January 2019, members of the House Democratic Caucus will support a member who has demonstrated he or she will focus on real solutions for all Texans, not on narrow, divisive, partisan interests." Rep. Lyle Larson, a moderate Republican from Straus' hometown of San Antonio, said the open nature of the race to replace the speaker will require candidates to "motivate different constituencies in the House." But he said Straus will be a tough act to follow. "He's a stabilizing force in Texas government," Larson said. "In the era of knee-jerk politics, we'll miss his measured approach to governance."